Having been running pop ups in venues all over London and further afield, for over three years, I like to think I've got the hang of ovens - I've used many, many different brands, types and styles of oven and however good they are and well they work I didn't think I could be truly impressed by a new oven. Until I went to see AEG's new Mastery Range at Grand Designs Live, and again at Taste of London. The new ovens that AEG have designed are like a new a sports car - one that's meant for F1 but has slipped through into the commercial market and is ready to be used in your kitchen today. They are SO exciting! I've now had the chance to see the ovens in action twice. First off was under the guide of Jozef Youssef at Grand DesignsLive where I learnt all about the sous vide function of the ProCombi Plus steam ovens. 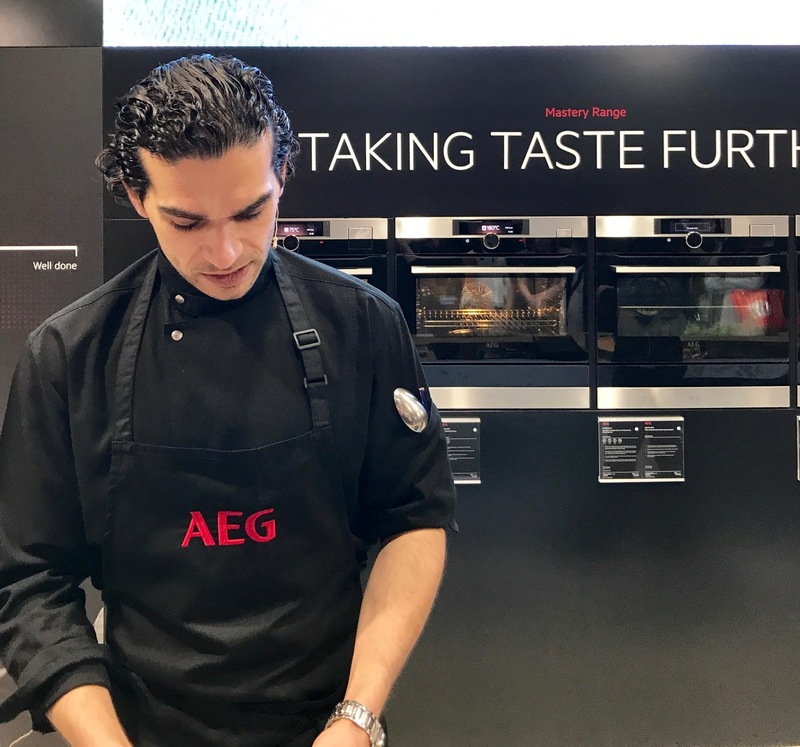 AEG have created an oven where you can cook meat, fish and vegetables in vacuum sealed bags to give a perfect cooking result every time, whilst retaining all the flavor of the food. With to the 0.5 degree accurate temperature, you can vacuum seal your food with whatever herbs, sauce or flavours you want, pop it in the oven and it will come out exactly the same every time - delicious! Not only great for cooking, the vacuum drawer, which is part of the Mastery Range, is also brilliant for preserving foods. By vacu-packing fresh food, you can majorly extend the fridge life of herbs, vegetables, meat, fish and dairy, as by removing the oxygen it takes longer for food to go bad. Jozef rustled up some super tasty and zesty octopus salads, having cooked the tentacles sous vide, followed by bao buns (cooked with the steam function) stuffed with rich, melt in the mouth pork that had also been cooked sous vide. You really can cook anything sous vide, meaning you can create restaurant worthy dishes at home - look out for lots of sous vide cooked foods on my pop up menus soon! And did I mention they do a self cleaning range?! Yup, no more harsh chemicals, overnight soaking and scrubbing. 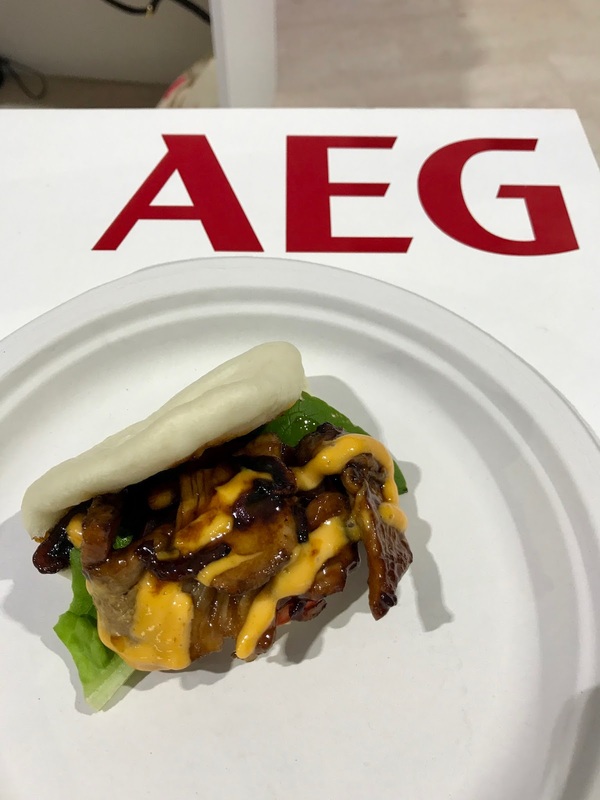 The next time I saw the Mastery Range in action was at Taste of London, my favourite food festival, in Regent's Park last week, where Jeremy Pang of The School of Wok showed us how to make fluffy, cloud like bao buns in the AEG steam oven. The two things that really amaze me about the AEG Mastery Range are the temperature control precision – the exact and consistent temperature means no more having to hang a thermometer in an oven and change the oven dial to 200C to get the actual temperature inside to read 180C as I have had to do with so many ovens, meaning that using the AEG ovens you can cook the same dish and it will come exactly the same every time – and the steam function. By being able to add and control steam in the oven it means you can cook perfect fluffy breads, juicy joints of meats, and light as a feather cakes. Normal ovens cook with dry heat, but the steam oven add moisture to the cooking environment. And the AEG Mastery Range also ensures that the oven is evenly heated throughout. Using the AEG induction hobs, which can heat up pans in seconds, my man took the reins and whipped us up delicious pork bao buns while I took photos and cooed over ovens! AEG's Mastery Range really does offer so much to the domestic market, and I can't wait to experiment more with the steaming and sous vide ovens - watch this space for lots of bread, cake and sous vide meat recipes coming soon!